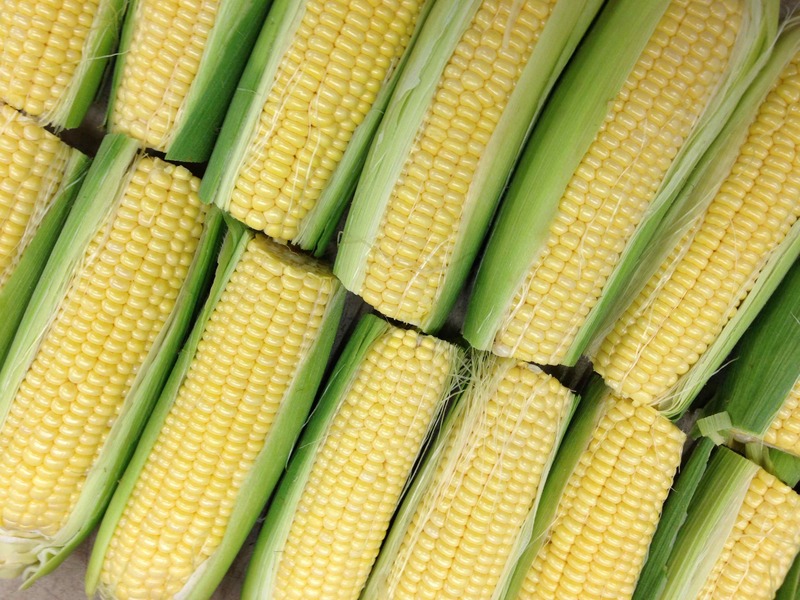 Tomorrow at the Town and Country Farmers’ Market we will have sweet corn. Lots and lots of sweet corn. Sean planted four acres of it at the Hope Spring Farm at the Cancer Treatment Centers of America and it is beautiful. You don’t have to do much to enjoy it – just shuck it and throw it in boiling water for a minute or two. Or you could enjoy it Aidan’s favorite way… grill the shucked corn for about a minute on each side, then roll in a shallow dish with a little balsamic vinegar and olive oil, and sprinkle with sea salt, parmesan, chopped mint and a touch of red pepper. That is a summer staple in our house. We will also have quite an array of peppers (beauties like Aconcaqua, Corno di Toro and Poblano), basil, all sorts of summer squash, eggplant, and cucumbers, especially those wonderful lemon cucumbers. If you haven’t tried the lemon cucumbers, get one before they are sold out and you will understand why they are so popular. And, of course, add shishito peppers to your list. They are on a number of menus right now as an appetizer, but they are so easy to make that you can enjoy them at home. I love these. Just pan-roast them in a little olive oil until they are a little blistered and the sprinkle with sea salt and a squeeze of lemon. You can also roast them in the oven at 450-degrees for about five minutes, until they have slight char marks, or throw them on the grill in a basket for just a moment. They are mild in flavor, but every now and then you will get one that will make your eyes water. This usually happens at the end of their season, so don’t worry about them just yet. And tomatoes… it is that time again. We have quite a number of beautiful varieties coming to the market, Garden Peach, Punta Bandas, and Golden Nuggets, and my favorite the Sun Golds. I grab them straight from the basket while I am cooking. On a different note, many of you have asked about the incident that happened at the Town & Country Market on Wednesday, May 22nd. One of our regular customers Bill, who is a long time friend of Bob’s, was leaving the market after finishing his shopping and the collapsed over his steering wheel while backing out his car. Some quick thinking people were able to get him out of the car and lay him flat. Our cashier Chris Davia, who has long been active with the Boy Scouts, saw what was going on and quickly began to administer CPR. Bill was not breathing nor did he have a pulse. To all who saw the ordeal it was quite harrowing and did not look good for Bill. Chris had seen a video on the new Chest-Compression-Only CPR method that was e-mailed to him just two weeks prior. He followed the instructions and continued the chest compressions until the paramedics arrived. When Bill arrived at the hospital, his doctors noted that those chest compressions saved Bill’s life. Bill is now recovering nicely and will hopefully be back at the markets soon. We want to commend Chris Davia for his heroic efforts that day and thank everyone for their concern and well wishes for Bill. The video that Chris watched is on the Sarver Heart Center website and is linked here at http://heart.arizona.edu/cpr-video. It is only six minutes long, but well worth watching.